I am always looking for “found poetry” – especially on posted signs – these are messages that make sense to the person putting them up – and maybe to the intended viewer – but are utter, strange nonsense (poetry) to the average passer by. Waiting for the streetcar, I saw the sign “Lower Pantograph Before Departing Stop.” Poetry. It isn’t hard to figure that one out, though. To me, a pantograph is a simple mechanical device consisting of linked rods used to enlarge drawings by hand. But it has an alternate meaning (at least one). 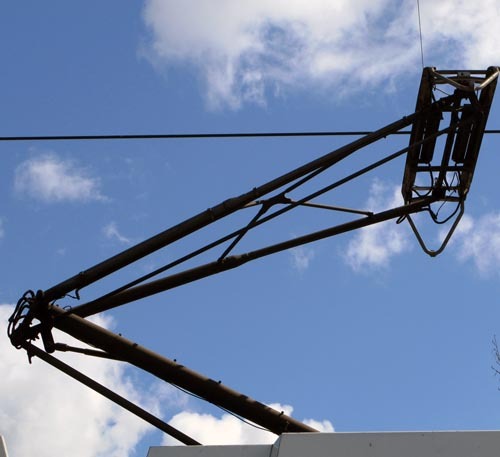 It’s the device on the top of a streetcar used to connect to the overhead wires. But what does “lower pantograph” mean? 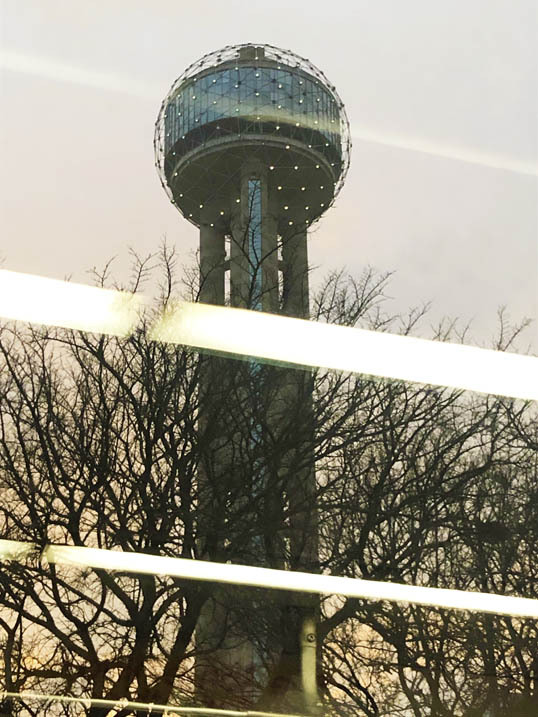 Well, the Dallas Streetcar has one unique property. One mile of its journey is across the Houston Viaduct, which has a historical designation. That means they could not install poles and overhead wires along that stretch of track. The streetcar uses internal batteries for that stretch, charging them with overhead wires the rest of the journey. 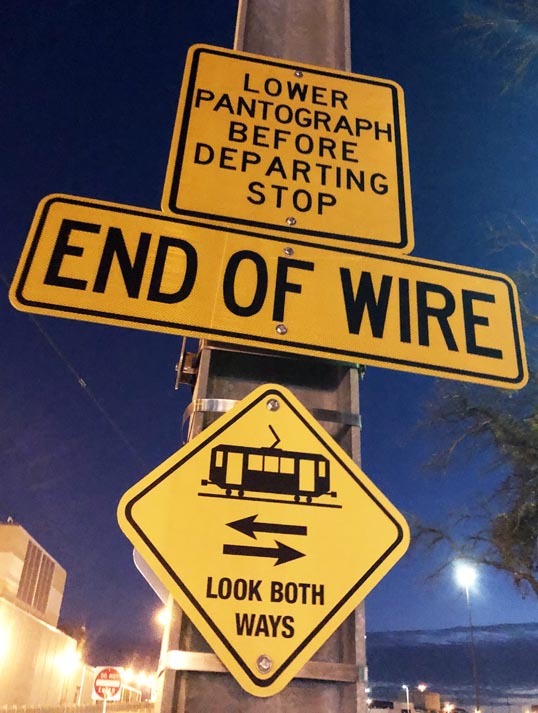 Therefore, the “Lower Pantograph Before Leaving Stop” and “End Of Wire” warning signs to remind the operator that the vehicle was about have to go on battery power. I still think it’s poetry. View from the high point of the Jefferson Viaduct Cycletrack, Trinity River, Dallas, Texas. 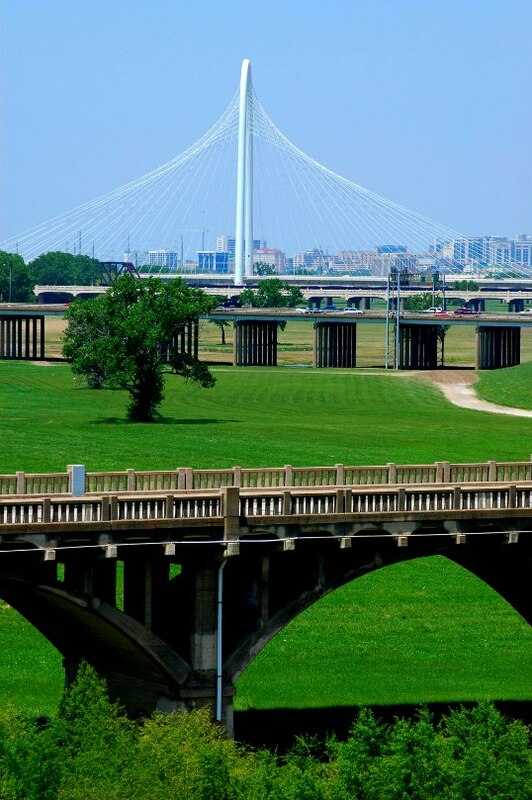 The closest bridge is the Houston Viaduct, where the Dallas Streetcar runs. I took this photo in 2012, the whole area looks different now – I’ll have to ride my bike down there the next sunny day and take an updated shot.